My children and husband gave me carnations as a Mother's day present. I was really glad to receive them. When we went shopping at the supermarket, my 8-year-old son suggested my husband to give it to me. I didn't notice that they bought them at the flower shop because I went to different places in the supermarket apart from them. I am really happy to be a mother, thanks to you! I hope your Mother's Day was enjoyable and you were not overly busy and were able to relax a little. The flowers look amazing. It sounds as if your son and husband are very good at planning surprises. I was really glad to receive it. Reason: Usually when getting a gift of flowers you generally use "them" rather than "it". I am not sure as to why. Your sentence as far as I can tell is still grammatically correct. When we went shopping to the supermarket, my 6-year-old son suggested my husband to give it to me. When we went shopping at/in the supermarket, my 6-year-old son suggested my husband should give them to me. 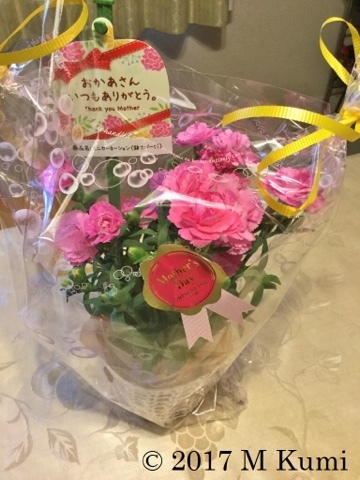 I didn't notice that they bought it at the flower shop because I went to different places in the supermarket apart from them. I didn't notice that they bought them at the flower shop because I went to different places in the supermarket and was apart from them. I am really happy because I could be a mother thanks to you! Opps! I found that I mistook my son's age!